Narayaneeyam is a 16th century classic treatise composed by Narayana Bhattathiripad. A great devotee of Lord Krishna, Bhattathiri composed this exquisite work in Sanskrit language as an offering. In Narayaneeyam, there are 100 Dasakas, of which Geeta has choreographed into dance 10 Dasakas. They are Bhagavanmahima, Bhaktiprarthana, Gajendramoksham, Balakreeda, Vishvarupadarshanam, Kaliyamardanam, Venuganam, Gopivastrapaharanam, Rasakreeda, and Keshadipada Varnanam. Geeta performed Narayaneeyam in the form of ‘ekaharya’ ballet (solo presentation) for the first time at Guruvayur temple in Kerala. 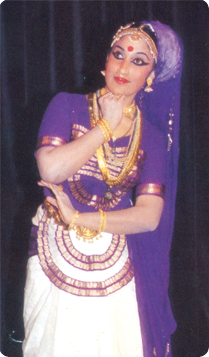 Thereafter, she presented 59 Narayaneeyam performances all over India and abroad as a solo danseuse. From 60th performance onwards her daughter and student, Radhika began to perform Narayaneeyam with her. On 9th Feb 2008, Geeta along with Radhika performed their 100th recital of Narayaneeyam at the Mahalsa Narayanee temple in Mardol, Goa, organised by the Goa Kala Academy. Geeta continues to perform Narayaneeyam at different venues. Geeta Radhakrishna performed her solo 105th Narayaneeyam performance at Guruvayoor temple on 19th Oct 2012 as part of Navarathri celebrations organised by Guruvayoor Devasam. Swamiye Saranam Ayyappa is another ‘ekaharya’ dance ballet based on the life of Lord Ayyappan. It is Geeta’s second major choreography. It narrates the story of Lord Ayyappa, right from birth till he retires atop the Sabari Hills. 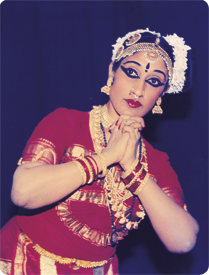 Magdalana Mariam is the third major choreographic work in Mohiniattam, for which Geeta received international recognition. Based on the well-known story from the Bible, Mary Magdalene, the portrayal emphasises the moral – “repentence is sin’s atonement. Penned by Mahakavi Vallathol Narayana Menon, in the form of marvellous poetic verses, this poem translated into the language of dance by Geeta, was well applauded and appreciated by the audience for the India Festival in U.S.S.R, Germany, Holland, Belgium and France. Karuna is a Malayalam Kavya composed by Kumaranasan – well known poet of Kerala. It is based on a Buddhist story of the beautiful courtesan Vasavadatta and the wise Upagupta. The 111 verses of Karuna were presented in Mumbai to a discerning audience. Krishna Leela is a unique poem of twelve slokas in Malayalam penned by Shri Krishnan Parapally. This award winning poem has been choreographed by Geeta and presented at various venues in Mumbai to an appreciative audience. Nritta Swara Manjari is a garland of swaras or musical notes interspersed with jathis or chollus of “Mohiniattam Adavus”. It is a choreography based on the 150 Adavus of the book “Mohiniattam Adavus and Mudras.” It has been specially choreographed for the students, to make the whole experience of learning the Adavus an enjoyable one. This has been presented by Geeta and her students, several times at different venues, both as a solo presentation as well as a group presentation. 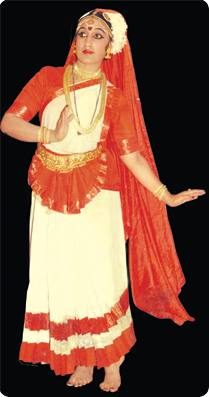 Maharaja Swathi Thirunal was a renowned king known for his passion for dance and music. Among the musicians, his name stands out like a shinning star. Though a Maharaja who ruled the state of Travancore in the 19th century, his greatest contribution has been in the realm of music and dance. 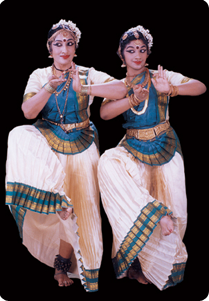 Mohiniattam dancers thrive on his compositions as the core of their Mohiniattam repertoire. Geeta and Radhika have given exclusive performances based on Maharaja Swathi Thirunal compositions, in various parts of India and abroad. 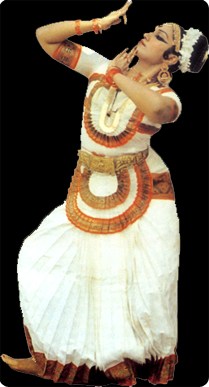 They have a vast repertoire of his Padams and Varnams, based on Sringara Rasa, the essence of Mohiniattam dance style. These items are presented for Lecture demonstrations on Mohiniattam too. Irayimman Thampi was a contemporary and court musician of Maharaja Swathi Thirunal. His compositions are well known for their lyrical beauty and charm. 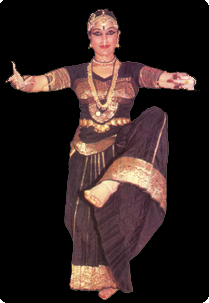 His famous lullaby “Omana thingal Kidavo” was for the first time choreographed into Mohiniattam repertoire by Geeta and still remains her master piece amongst her choreographies. This item has been performed innumerable times all over the world. 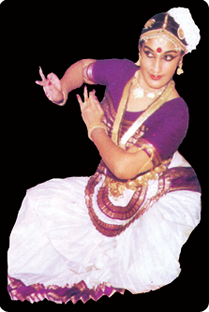 Sringara Mohini is based on “Sringara Rasa” the essence of Mohiniattam style. The choreography celebrates the sentiment of Sringara – the rajarasa –the king of emotions through various texts. It enumerates the different aspects and shades of love and beauty. 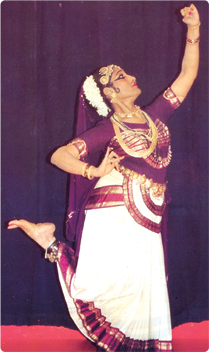 Performed this work in dance in Mumbai, Delhi, China for dance recitals and lecture demonstrations. Prakruti Nrityam is Nature’s dance. This programme was presented by Geeta and Radhika, with a Grant from the Dept of Culture, Govt. of India. The choreography highlights nature’s expressions through its manifestations like the flora and fauna. Padma Nrityam (The Lotus dance) and Mayura Nrityam(The Peacock dance) are the opening and closing numbers. Kalidasa’s “Ritu Samhara” with its varied seasons form a part of the presentation. The Mother Earth and its various aspects have also been explored. Presented in 2003, it created an awareness and keen interest not just among dancers, but amongst nature lovers and environmentalists. Ashtapadiattam is based on Geeta Govinda, a 12th century Sanskrit poem by Jayadeva. The lyrical beauty and charm of this incomparable work is both sung and danced by Geeta. 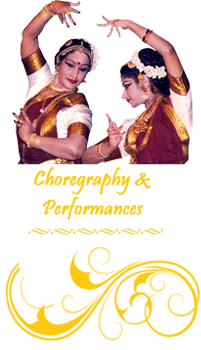 The dance is performed with Sopanam music- the temple music of Kerala. The poetic genius of Jayadeva has also attracted the dancers of various classical styles. 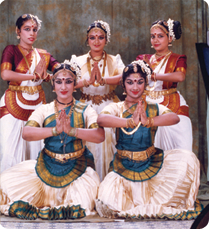 Geeta, Radhika and Bindu (Geeta’s student of Mohiniattam) have danced the love lyrics of Radha and Krishna at different venues and temples in the enchanting style of Mohiniattam. Aum Namah Shivaya is a choreography based on the cosmic dancer Lord Shiva and His Shakti. The age old Shiva Parvathi stutis and stotras like Shiva Panchaksharam, Shiva Shadakshara stotram and Sankaracharya’s Soundarya Lahiri have been choreographed. It was presented for the first time at the Uttara Chidambaram temple, in Satara District of Maharashtra in 2003. Devi Mahatmyam eulogises the benign and the virile forms of Devi in her various aspects of Maha Durga, Maha Sarasvati and and Maha Lakshmi. Presented along with students at various venues in Mumbai. “Aaru Padai Veedu” A presentation of Tiruppugazh songs in Mohiniattam style. Tiruppugazh was penned by Saint Arunagirinathar in praise of Lord Muruga in Tamil, with exquisite lyrics and rhythm. With a word or a stance the poet delves deep into the whole episode of moral magnitude and wisdom. Geeta presented for the first time the Saint’s perception and philosophy through the visual media of graceful Mohiniattam. Creation of the Universe A theme based on the book of Genesis. A group choreography with the participation of 80 students highlighting God’s seven days creation of the world. 1988 Festival of India in U.S.S.R. I.C.C.R.- Govt. of India & Govt. of U.S.S.R.